I am very pleased with my pescador kayak. I have been very pleased with the service you provided. Outstanding. This kayak is light weight, easy to transport, easy to paddle and comfortable to sit in. This is one of my first owned kayaks. I use it on nearby lakes. Highly recommended for beginners and I can definitely see this working for me and my family for many years. The kayaks arrived in perfect condition. We just used the them this weekend for the first time. They are dry and very stable. We had some pretty heavy boat traffic and still had no difficulty. Really happy with this purchase! Love our kayaks, not too heavy to handle and lots of fun. Love my kayak, very nice, not too heavy and handles good. A: Hey there, thanks for the question! I've measured one of the available ones in our warehouse, confirmed at 32 inches. Q: What is the advantage or difference between the pescador 10.0 and the pescador pro 10.0? A: The Pescador Pro is going to have more built on features for angling. Q: Does this kayak track well? A: Hi! This Kayak has its' priorities set on stability and maneuverability, so these features will be more prominent. However, this kayak will still move quickly and effectively for you with terrific control. Q: The plastic cap just above cup holder in the center counsel. I've seen that when removed there's a threaded hole there. 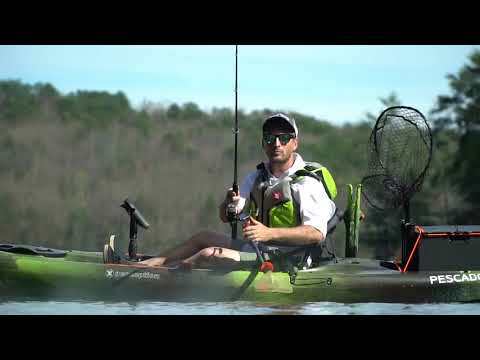 Does the perception Solo mount ram ball fit on this kayak? A: This is meant for the sound, but I checked a Pescador 10, and the perception ram ball will fit in that area, so it should be the same on the 10. Q: Do aftermarket seats (i.e., stadium type seats - framed or unframed) fit in this kayak? Q: Does this kayak come with Paddles or do you buy them separately? A: Thanks for your question! This kayak does not come with paddles. Please let us know if you need any help with selecting paddles that will work best for you! Give us a call at 888-828-3828. Q: Is the back large enough to fit a milk crate for gear? A: Yes, the rear storage area is big enough for a milk crate. If you need anything else please let us know!